I custom designed several items for his party using Cars character graphics purchased from Etsy. The invitation was sent digitally via e-mail or through Facebook, but I printed a few copies for grandparents to have as a keepsake, as well. Guests arriving to the party were greeted at the front gate to “Archer’s Speedway” (a.k.a. our backyard) by a colorful balloon arch and a black metal utility cart decorated with checkered flags, an inflatable tire, and stacks of custom “oil cans.” The cans, decorated with branded sayings such as, “Lightning Motor Oil” and “Archer is 3 Premium Racing Oil,” were such a fun detail that nodded to both the Cars party theme and the birthday boy himself. I also designed individual VIP pit passes with the different Cars characters for all of the kids (or “crew members”) in attendance. These served as the party favor and were a big hit with kids and parents alike! Archer still loves playing with his a month later! 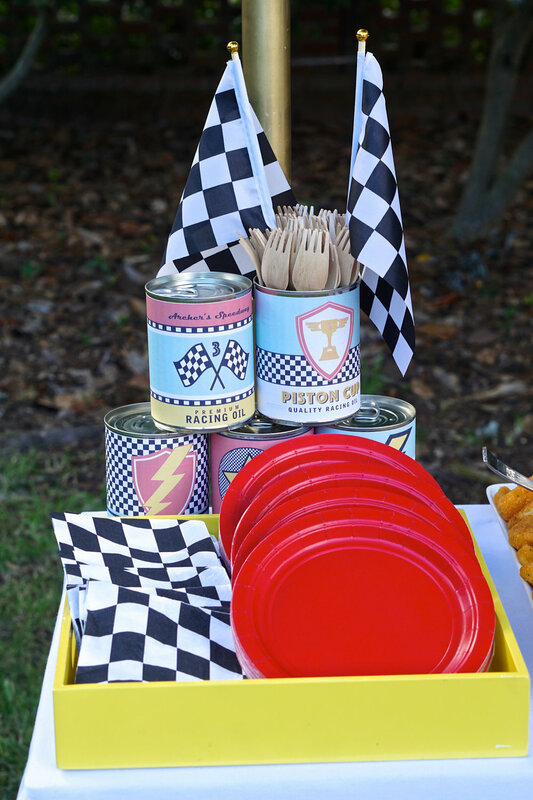 The food table was decorated with a checkered table runner, handmade colored bunting, more stacks of “oil cans”, and a large vintage “A” for birthday boy Archer. A colorful balloon swag hung above and added the perfect festive touch. And a super fun checkerboard birthday cake that my mom so graciously made! I set up a pint-sized checkerboard photo backdrop for people to snap pictures of their kiddos. 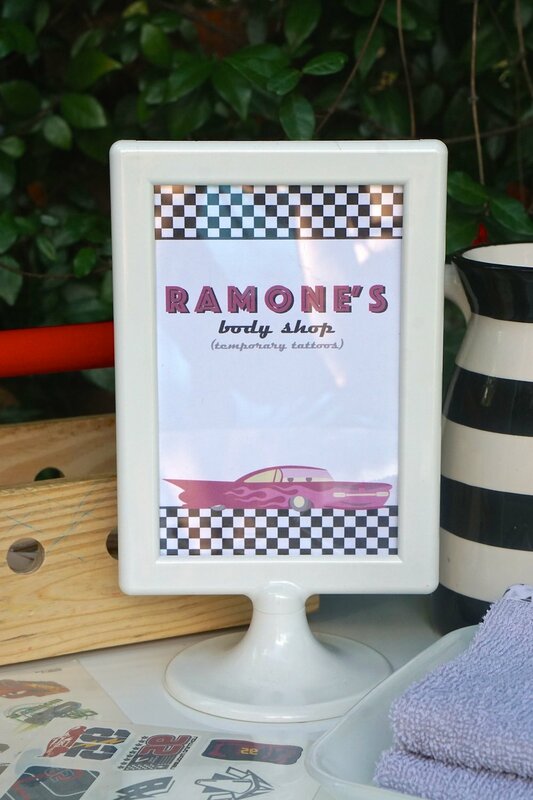 There was also a small table for a “Ramone’s Body Shop” station with all the supplies needed for putting on Cars/racing themed temporary tattoos. Thanks so much for reading along! I so hope you enjoyed this post. Until next time!